Despite some functional annoyances, the Pocket Operators are a lot of fun. The price. Those animated displays. Sync capabilities. Patience required. Minimal documentation. The display is not always helpful. Last year Teenage Engineering got tech-nerds and hipsters alike palpitating with deconstructed, retro-edged, yearning on the announcement of its three upcoming calculator-style synths designed in collaboration with Swedish clothing brand Cheap Monday. Besides the question of what a company that makes jeans has in common with a cutting-edge audio company, most focus was centred on the unusual display that featured as a centrepiece to these new synths. The next question was usually whether they would prove to be amusing toys that happened to make a noise, or cheap-and-cheerful drum machines and synths that could be used to create worthwhile music. We'll revisit that question later. The Pocket Operators include Rhythm (a drum synthesizer), Sub (a bassline synthesizer) and Factory (a melody synthesizer), with the latter two harnessing synthesis methods ranging from FM and subtractive to wavetable and physical modelling. 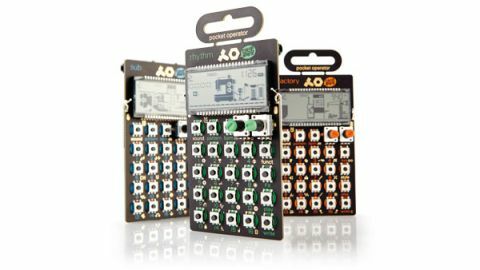 The Pocket Operators come in a similar deconstructed packaging to the Teenage Engineering Oplab unit looked at in FM last year. In other words, there's no case - though these are available as an optional extra. "For the PO-12, think the Roland TR series mixed with a Linn LM-1 or Oberheim DMX, but more gritty"
Each PO is palm-sized and, once you've peeled off the cardboard shell that doubles as box and quick start guide, you reveal a monochrome screen, 23 small buttons and two pots. Unfortunately, just getting this far caused one of the knob caps to come off. Each unit also has a display hanger attachment built-in - and these are also rather precarious, though in fairness they are designed to be snapped-off should you go for a Pro Case. As with the Oplab, everything is mounted to the circuit board (including the rear panel AAA battery holders and 3.3mm ins and outs). The screen of the Pocket Operators is centred around a particular visual theme - a sewing machine (PO-12 Rhythm), submarine (PO-14 Sub) and factory and crane (PO-16 Factory) - which are reminiscent of Nintendo's early-'80s Game and Watch hand-held games. In each scenario different elements move and respond to button presses when playing back patterns. There are a few parts of the display which provide more direct visual feedback (including tempo and the positions of the two pot controls), but everything else has to rely on a three-digit display area at the top right of the screen. So, from the outset the focus appears to be on fun rather than functionality. With this and the cost in mind, it is understandable that the LCDs are not backlit, and in practice this wasn't an issue. We decided to dive in with PO-12, the Rhythm section of the family. After plugging in the batteries - which apparently can keep the unit on standby for two years - it was time to turn the unit on. Except that there is no on/off switch, so it's merely a question of diving straight in, having a play and then leaving the unit to drop into standby mode when you've finished (which keeps the LCD screen on, but LEDs off). There's no external power option here, though modding one yourself wouldn't be too difficult. Pressing the button marked 'play' was simple enough and set the beats in motion. However, it became pretty clear from the start that we needed to run through the quick start guide, and refer back to the overview schematic, and then dive into the manual. There are quite a few combination key presses and knob-twists to remember in order to get to all the features on offer. In essence the PO-12 offers 16 sounds (each with two adjustable parameters) that are triggered by one of the 16 (16-step) patterns. Patterns can be recorded live (and are automatically quantised), or in step-mode, where individual steps can be turned on or off for each sound via a 4x4 grid (buttons 1 to 16). The sounds in the PO-12 lean very heavily towards those found on drum machines of the early '80s. This was a time when both analogue synthesis and limited bit-depth sampling techniques were used. So think of the Roland TR series mixed with a Linn LM-1 or Oberheim DMX, but altogether more gritty and lo-fi - there's a lot of digital aliasing on some sounds. Whilst we wouldn't say this little box has class, it does certainly have character, though you will need to plug it into a decent sound system if you want to hear more than the high-frequency, biscuit-tin soundalike, from the built-in speaker. That said, the tiny onboard speaker is a marvel of concealed engineering. Holding the Sound button while pressing one of the numeric buttons, selects the relevant drum sound for auditioning or step-entry. Here it's possible to see what the two knobs offer in terms of sound editing. The most common parameters are pitch and decay, but in some cases there is more going on under the hood - bit-depth reduction, doubling and snappiness being a few. We were initially somewhat confused, as making tweaks when a pattern was paused did not make any difference as soon as Play was pressed. It turns out that parameter automation is permanently engaged, so the Write button needs to be pressed while making any sound edits for them to become permanent. This is much like a permanently engaged version of Korg's fabled Motion Sequencing, introduced on its earlier Electribes - and still in use on the Volca range. Now throw in 16 different (non-editable) effects that can be switched between on-the-fly and it soon becomes apparent that the Pocket Operators are capable of conjuring up some, occasionally inspired, sonic madness with ease. Like the other sound parameters, the effects selection is automated (and is engaged even when Write isn't pressed). "All three Pocket Operators are capable of creating some interesting, and usable, musical elements"
The final piece of the picture here is the so-called 'step multiplier' that allows you to add custom glitch-style re-triggers (2, 4, 8 or 16) to any step in a particular sound's pattern (unlike the globally applied stutter effects). Once you get a handle on these additional keypress combos, and some of their underlying operational quirks, they add another level of interest to even the most lacklustre beat. Patterns can be copied to other slots and chain together with repeats very easily to make a longer 'song'. All the time you are doing this, there's the frantic sight onscreen of a small stick figure controlling a sewing machine and bashing out beats. Without wishing to sound too dry or aloof, this provides some brief amusement but we wished more of the screen could have been used for parameter and beat-making feedback instead. Bah humbug! The PO-14 Sub synth follows a similar format to the drum module in terms of layout and broader aspects of pattern programming, but this time with a monophonic bass synth combined with a 16-part 'micro drum' section. 15 different bass sounds provide the starting point here. Having selected a sound and cleared the current pattern, the easiest way to get something going is to use the buttons (arranged as two octaves of a major scale) to 'play' a bassline. Effects can be added as before - they are the same in each unit - though for some reason the button is named 'style' this time. The 'func' button is labelled 'key' on this one but, even more confusingly, this doesn't have anything to do with the key of the pattern, but allows you to access the 'play styles' which turn your simple single-note bass notes into arpeggios and other interesting note sequence effects. Those opting for a, pricey but nice, Pro Case (£39) will find that this is rectified to provide unity across the range. Like the audio effects, their selection can be automated and saved as part of the pattern. For more detailed programming, you can edit the note pitch and length of each step and the two synth sound parameters. Should you choose the 16th sound, you get a selection of drum hits chords and effects, which can run in parallel to the bass section. PO-16 Factory is much more closely aligned to Sub with regards to function and sonics. The main difference here is the preset synth sounds and micro drum elements, with the focus being on melodic and harmonic lines. Like the PO-14, there's no description of the various play styles in the manual. We're all for experimentation and play, but this minimal approach to documentation (physical or online), which was also evident with TE's Oplab, is not especially helpful. In use these units can be a little confusing, so patience is required if you are after more than pseudo-random noodling. The small step LEDs are not always clear, making it somewhat difficult to track the current step. The sync options via the in/out jacks are helpful for running the units together or with other gear. There's no MIDI, which is to be expected. We did notice a rhythmic ducking in level on some occasions, no doubt caused by the 'auto compressor' and hardware limiter, but these do make for a more punchy sound. All three Pocket Operators are capable of creating some interesting, and usable, musical elements, though if we had to choose one it would definitely be the PO-12 Rhythm box. And for those who may be of a tardy persuasion they all have a built-in alarm clock!